Opinion: How Much Is Ukraine Worth To The West? BERLIN, Germany -- Rescuing a state in crisis can be expensive. Germany has pledged further assistance to Ukrainian President Petro Poroshenko, in return for more reforms. Rightly so, says DW's Bernd Johann. Ukraine needs help from the West. Financially, the country is on the brink of collapse: its economy is shrinking, and the ceasefire in the east is fragile. At the moment there are only minor skirmishes, but the risk is very high that the situation could escalate once again. Ukrainians now fear, quite rightly, that the strategically important port city of Mariupol will become the separatists' next target, an attempt to create a land bridge with Crimea. The sensitive military situation and the economic crisis were the main topics of discussion during Ukrainian President Petro Poroshenko's short visit to Germany on Monday. Chancellor Angela Merkel and President Joachim Gauck welcomed him in Berlin with open arms. Although Ukraine is currently out of the major international headlines, its problems have not diminished. In order to stabilize the Ukrainian economy, the International Monetary Fund (IMF) last week put together a huge financial package for the country. The IMF and other donors have committed $40 billion (37.8 billion euros) over the next four years - mainly in the form of financial aid. As the EU's largest economy, Germany has also pledged its help for Ukraine. Germany, which currently holds the presidency of the G7 countries, has also coordinated a part of the international support. Officials in the Finance Ministry in Berlin have been looking over Kiev's financial needs for weeks. The war in the country's east has alone racked up billions of euros. By inviting Poroshenko to Berlin, Germany also showed Russia that is has not forgotten the annexation of the Crimean peninsula one year ago. Speaking with the Ukrainian president, Merkel and Gauck made ​​it clear that the Kremlin's actions - a violation of international law against an independent state - will never be recognized. But neither Poroshenko nor the German government currently have a plan for when, and how, Crimea could once again become Ukrainian in the near future. It also remains unclear whether the Minsk agreement, the ceasefire signed four weeks ago, will endure. The behavior of Moscow and the pro-Russia separatists remains unpredictable. OSCE observers still do not have free access to the disputed territories - and the OSCE mission remains much too small to monitor the 400-kilometer (250-mile) front line. More staff is needed, but that will probably take months. More equipment is also needed on site, primarily more drones that could effectively monitor troop movements. But Russia has blocked the decision-making process in the OSCE, thereby demonstrating how little interest is has in complying with the ceasefire. Kiev is expecting a new major offensive by the separatists, and Poroshenko has therefore called for arms shipments from the West. Berlin, like many other European capitals, has stalled on this issue, fearing that this conflict could escalate even further. But Ukraine needs modern weapons systems, as well as drones for air reconnaissance. The Ukrainian army does not have much to counter a new attack by the Russia-equipped separatists. 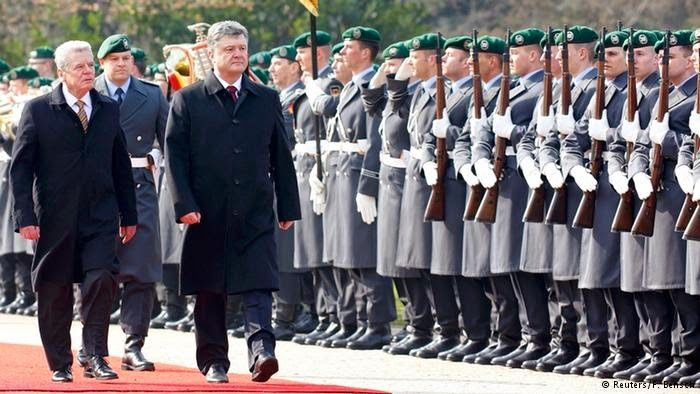 Economically, and especially financially, Poroshenko has the necessary backing from Berlin. In return, he now at last must set in motion long-promised reforms. In addition to the independence of the judiciary, that includes the fight against corruption and the oligarchic economy. They are - apart from the war - the main obstacle to economic stabilization. Ukraine's rich are still sending much of their money out of the country. Poroshenko has not yet done much to tackle the problem, perhaps because he himself, as owner of several companies, belongs to the oligarchs' circle. The West knows that saving Ukraine could be an expensive venture. How much it's willing to give in the end remains to be seen. The collapse of Ukraine must be prevented - but no one wants to invest in a bottomless pit. Stabilization can only succeed if the war comes to an end.